On Saturday April 13, Police from the Centenary Crime Prevention Unit, Mount Ommaney Road Policing Unit, Calamvale Station, Police Liaison officers and Volunteers in Policing (VIPs) were joined by the Centenary Patrol Group Inspector to host Coffee with a Cop at Calamvale McDonalds. The police bike proved to be a hit with the young and the not so ‘young’ kids, who were very keen to have photo on it. 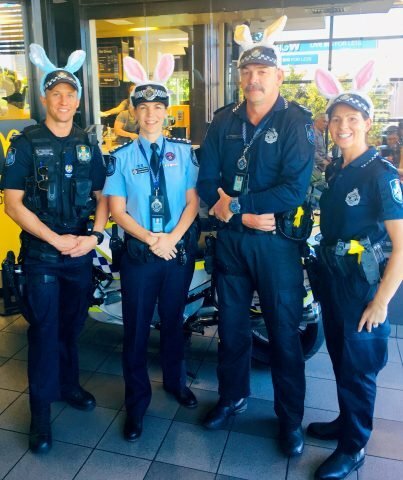 During the event, police were also able to get into the Easter spirit by donning some festive bunny ears and handing out some chocolate Easter eggs to the local community – something which was again a hit with the kids! During the event, police engaged the local community and educated on the South Brisbane District road safety campaign, Operation Wake Up, which officially re-launched on Friday April 5. This road safety campaign runs through the whole of the Easter Holiday period until April 26, inconjunction with the state-wide campaign, Operation Romeo Solace. Over the Easter period, many families will enjoy the time off and travel on holidays in their cars and police would like you to take care on the road and be safe. Police wish everyone a very safe and happy Easter on our roads these holidays and look forward to seeing you at our next event.